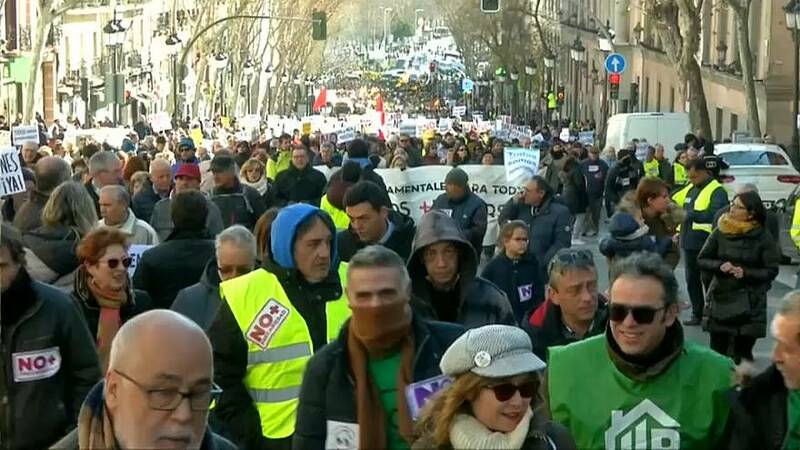 Thousands of Spanish senior citizens took to the streets of Madrid on Saturday to demand better public pensions. The protesters said recent increases — which included a 0.25% rise in 2017 — have been too small and should instead match the rate of inflation. "Defend your pension and the pensions of the future," one banner carried by the protesters said. They were joined on the march by the Spanish capital's taxi drivers, who have been on strike for nearly two weeks. José Miguel Fúnez, a spokesman for the Madrid taxi drivers' federation, said: "Our parents and our elders are supporting us economically, so we can continue this fight to end this job instability, the flight of money from our country, and the corrupt politics we have seen over the last 25 years." The taxi drivers have been on strike for 13 days over demands for tighter regulation of ride-hailing apps like Uber. Spanish Prime Minister Pedro Sanchez has offered the pensioners a 6% increase, but retired citizens and unions are understood to be holding out for more. They have allied themselves to Madrid's taxi drivers, who are on strike in a separate protest over regulation for ride-hailing apps like Uber and Cabify.